Home > Internet > Demonetisation - Is India Ready to Go Cashless Digital? Demonetisation - Is India Ready to Go Cashless Digital? One of the major offshoots of the demonetisation drive is a push towards a cashless, digital economy. 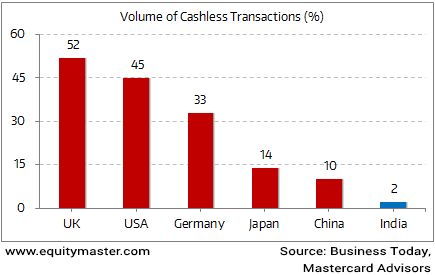 In today's chart of the day, we have presented the quantum of cashless transactions in some of the major economies of the world...and how far India has to go to become a cashless economy. The statistics are startling. Just nearly 2% of the volume of economic transactions in India are cashless. Less cash would mean less black money...less corruption...and more transparency. But is India really ready to go digital? We don't think so. In our view, digital India is a way distant dream...particularly for rural India. As per Newslaundry.com, there were 5.3 bank branches per one lakh Indians in rural India 15 years ago. Today the figure stands at 7.8 bank branches per one lakh Indians. This shows that a majority of rural India has very little access to banks and the organized financial sector. They rely heavily on cash and the informal credit system. Then, we have just 2.2 lakh ATMs in the country. For a population of over 1.2 billion people, that's a very small number.